Yosemite National Park Fire Managers are planning one of two prescribed fires in Yosemite National Park, weather and air quality permitting, October 28, 2015. The projects are either the Mariposa Grove of Giant Sequoias or a portion of Soupbowl along the Wawona Road. Both of the projects have been planned for the fall and are near the southern entrance of the park near Wawona. Fire managers are planning the projects in front of a predicted storm with only one being selected. 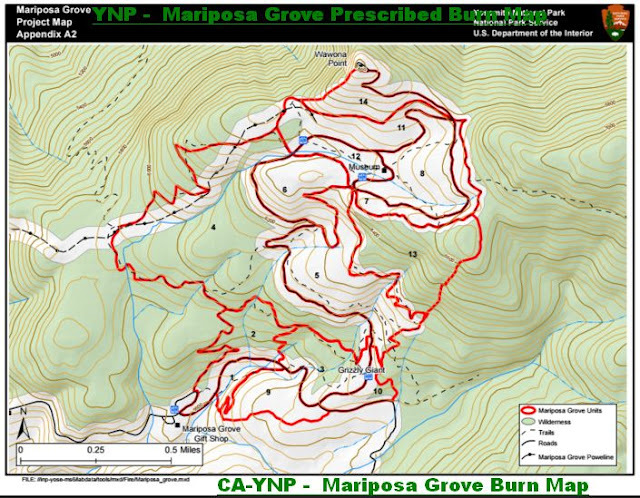 The Mariposa Grove project is the highest priority and is near the top of the Grove from Wawona Point to the south. 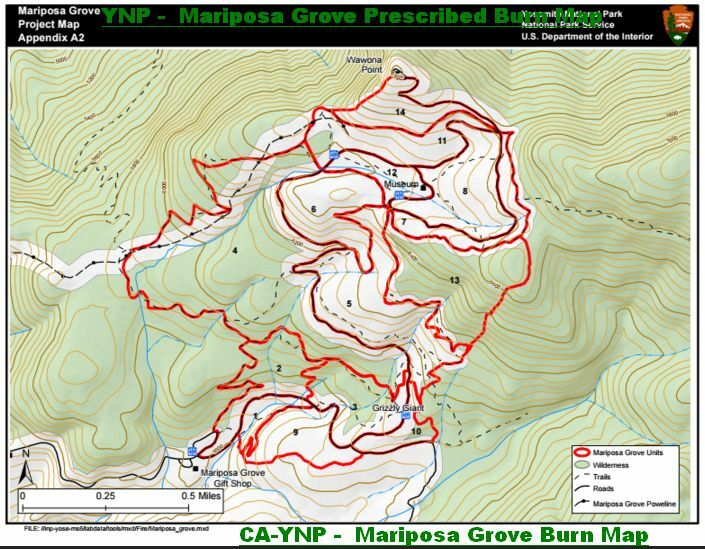 Fire managers want to take advantage of the Mariposa Grove closure to conduct the 114 acre burn project. Burning in the Grove is a continuous process and the burn areas have experienced fire in the past. Fire produces the optimum conditions for Giant Sequoia reproduction and propagation. Fire not only removes the accumulated layers of dead woody debris exposing nutrient rich mineral soil, but dries the cones allowing the seeds to shed. Fire also creates holes in the forest canopy, while eliminating shade tolerant competition. 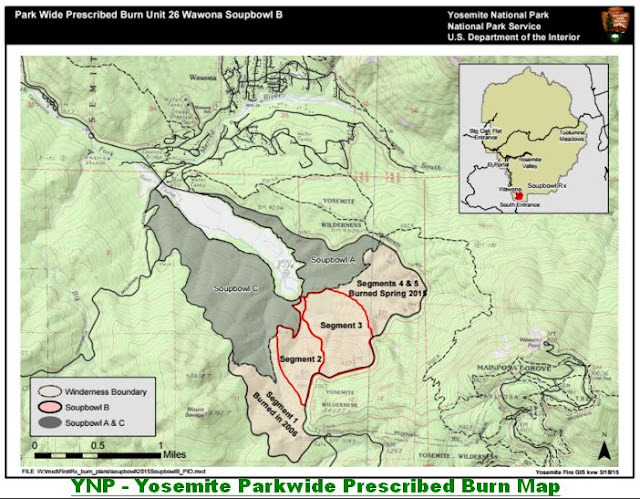 The Soupbowl project is to create a black-line along the Wawona Road in preparation for the entire prescribed fire project area at a later date. The primary objective is to reduce hazardous fuels within the mixed conifer forest adjacent to the Wildland Urban Interface (WUI) community of Wawona, park infrastructures at the south entrance station and the Mariposa Grove of sequoias. This project creates a continuous area of reduced fuel by linking together multiple previous prescribed fires. A secondary objective is ecosystem restoration. Applying fire under prescribed conditions mimics the frequent, low intensity, lightning caused fires that occurred in Sierras prior to the exclusion of fire which began over 100 years ago under aggressive fire suppression policies. Historically, natural fire burned an average of 16,000 acres annually in Yosemite and played an integral role in shaping Yosemite’s ecosystems. In the absence of frequent fire, unnatural levels of forest biomass have accumulated which has put many of Yosemite’s values at risk, including neighboring communities, and natural and cultural features. As climate changes, these values become increasingly vulnerable to catastrophic wildfire. Smoke from the fire may be visible within the Wawona area and south entrance. Smoke, affecting health, is always a consideration in the decision to schedule prescribed fires. A smoke management plan has been submitted to the Mariposa County Air Pollution Control District, and a burn permit will be issued prior to ignition. A smoke monitor will be placed in nearby communities to monitor smoke.